Filed to: Tinder What?Filed to: Tinder What? In an interview with Cosmopolitan, Channing Tatum’s theoretical second cousin expressed his frustration over dating as famous-ish person while preparing for next month’s Olympic games in Rio de Janeiro. After trying dating apps like Bumble and Raya—the former of which only allows female users to initiate conversations with other users, and the latter of which is an app exclusively programmed for celebrities—Lochte decided to switch to Tinder. Well, one, with Bumble[,] the girl always has to make the first [move], and I don’t really like that. I don’t think that’s a woman job...[so] I got off that. 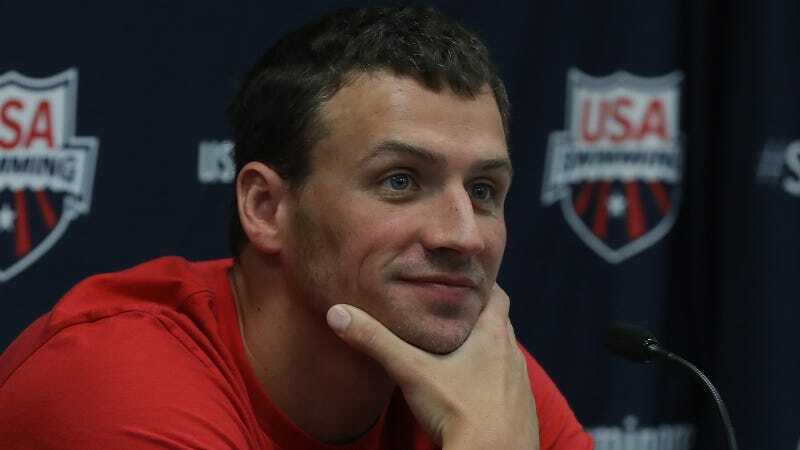 After becoming discouraged by Bumble-using women and their jobbing, Lochte created a profile on Tinder, which he first heard about during the 2014 Winter Olympics in Sochi. I heard it took off in Sochi [at the 2014 Winter Olympics] and then people were talking about it and I was like, “Let me try this.” So I got on it and I’ve been matching up with a bunch of gorgeous women who are smart, they have professional jobs and everything. I’m like, “Wow, this is perfect.” So I’ve been on Tinder lately. So far I haven’t had any dates or anything. I’ve just been talking with a couple [women]. But wait! Ryan is looking for “smart” women with “professional jobs” and everything? Is he, like, slightly on his way to...woked? You can’t say like looks aren’t everything because, I mean, that’s the first thing that people see. Through text messages and on the phone she talked but then in person it was just like she was a mute and I was like, “Can you please say something?” The whole dinner was kind of ruined. But I got to eat a lot. Still, the question remains: has he tried OKCupid?